Developer Quote: "Wanna try something new in the world of line drawing games?" 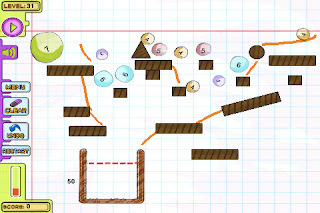 This game uses doodle-like graphics as its main structure. This creates a simple but effective board on which to play this puzzle game. COOL CONCLUSION: "Draw your way into high scores with Make Way using 'your marbles' to come up with a successful strategy!" --Developer Link: Dumadu Games PVT Ltd.